As Lincolnshire’s leading Independent Land Rover Specialist, Famous Four are constantly in demand for service, repair & restoration work on Land Rover & Range Rover models old and new. With our dedicated and experienced staff of trained technicians constantly busy handling jobs of all shapes and sizes we have had to expand our facilities to accommodate the work load. 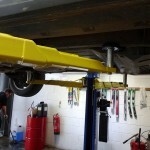 Expanding on our already comprehensive, state-of-the-art workshop facilities, we have added a third 2-post lift to our existing pair of 2-post lifts and our 4-post lift. 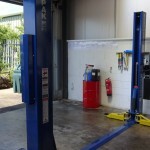 More lifts means more work bays are available to carry out service and repair work, which results in us being able to serve our workshop customers faster. Engineers from our dedicated heavy equipment service company arrived early this morning to get the ramp in and working. They wasted no time in unpacking, checking, marking out and installing the lift which has the capacity to lift most Land Rover and Range Rover vehicles. Once installed, a safety check and lift test was carried out and the lift was declared ready to use. Not bad for a morning’s work. 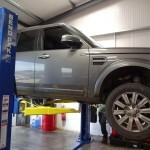 If you’d like further information on our Independent Land Rover service, repair and restoration services, see our Workshop page on the main website. 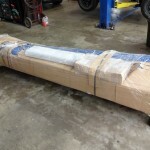 Just like IKEA… only much heavier! Installed and ready to go!